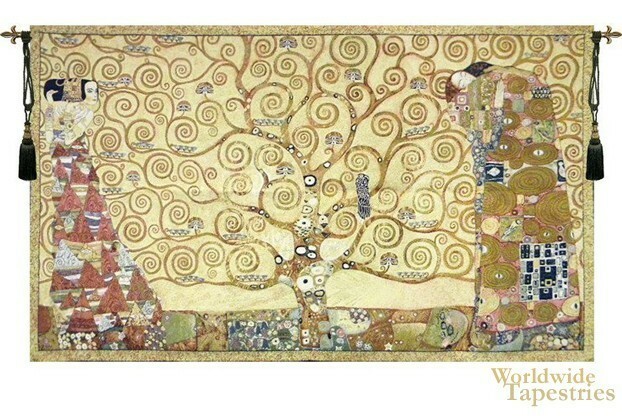 Klimt Tree Of Life Vtapestry is based on the work of Gustav Klimt called the Stoclet Frieze. This Austrian painter produced works of a unique nature and style, and this piece was commissioned for Palais Stoclet in Brussels. In this decorative piece we see the Tree of Life a symbol if natural power and immortal life, in characteristic geometric motifs of curves and three figures. There is a lady with dark hair looking on, and a lady and man in an embrace. Their robes echo the geometric fantasy and is filled with patterns and colors that is characteristic of Klimt's style. The style of Klimt is known as Symbolist and is part of the Vienna Secession group of artists. This tree of life tapestry Klimt Tree Of Life Vis backed with a lining and a tunnel for easy hanging. Note: tapestry rods and tassels, where pictured, are not included in the price. Dimensions: W 53" x H 31"